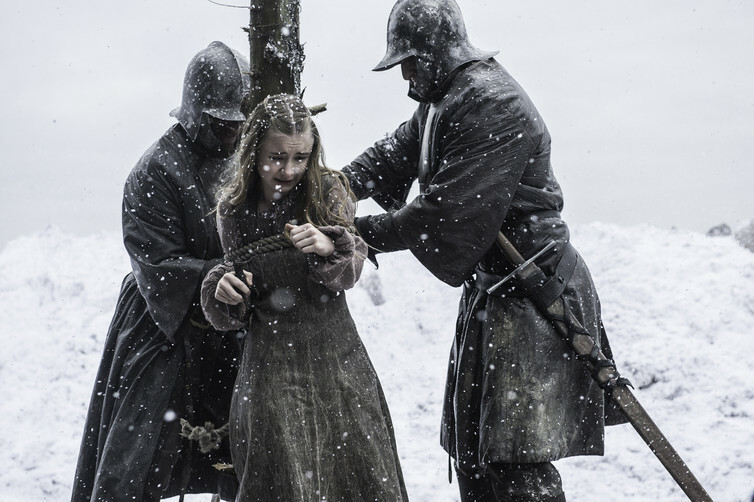 Every Game of Thrones season premiere needs its shock reveal – and season six is no different. 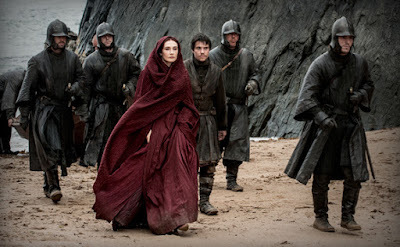 As the name of the episode – The Red Woman – hints, this one pertains to red priestess Melisandre, to whom, it turns out, there’s much more than meets the eye (don’t worry, no spoilers ensue). Even in a series known for its complex characters and even more complicated morality, Melisandre and her motives remain surprisingly opaque. And it looks as if her story’s only just getting started. Admired by some, loathed by others, and feared by many, she was the driving force behind Stannis Baratheon’s claim to the throne of Westeros. She had prophesied that he was Azor Ahai, the champion of the Lord of Light reborn, and, as such, Westeros’ best hope against the coming darkness. Inspired by her prophecies and her mysterious powers, Stannis gave up his faith in the seven gods of Westeros and made her one of his most important advisers. Although monotheism is probably more familiar to viewers than the polytheistic beliefs held by most of the characters on Game of Thrones, it was hard not to be troubled by Melisandre’s religious message. On one hand her prophecies of the coming of a saviour, a hero from the Lord of Light who will defeat the forces of darkness, will sound familiar to those raised in the Christian tradition. But on the other, her god requires blood sacrifice from his followers, which suggests more sinister rituals. Like Melisandre herself, the motives of her god, R'hllor, remain murky. These sacrifices were not only condoned but encouraged by Melisandre, who urged Stannis to burn his daughter Shireen in order to ensure his victory. In our history, wars have been fought in the name of God and heretics have been burned for incorrect beliefs. But child sacrifice is usually associated with religious deviants or covens of witches. And indeed, in spite of Melisandre’s own confidence her visions, Stannis’s death at the end of season five suggests that she has either been deceived or misinterpreted the messages sent by her god. Recent revelations suggest that Melisandre may be more of a witch than a prophet. Shireen’s sacrifice. ©2015 Home Box Office, Inc. The line between between divinely inspired prophet and devilishly influenced witch has always been blurred, especially where women were concerned. The later Middle Ages in particular experienced a flowering of women’s mystical experiences. Although not allowed to become priests, women in this period were increasingly drawn to visions and prophecy and some, like Melisandre, became enormously influential as a result. Bridget of Sweden, for example, successfully campaigned for the papacy to return from Avignon to Rome, and after her death, the account of her revelations circulated widely. The military victories of Joan of Arc made possible the coronation of Charles VII of France and helped bring about the end of the Hundred Years War. But if God had messages for the faithful believer, so did the devil and his legion of demonic followers. The difficulty was in telling the difference. Sometimes demons impersonated angels or other holy figures to lead the vulnerable astray. Early theologian John Cassian provides a cautionary example of a monk who, after 50 years of pious living in the desert, is deceived by a demon disguised as an angel and throws himself down a well thinking that he is following a divine commandment. When even the pious are not safe from demonic attack, determining whether inspiration is from God or the devil becomes critical. Theological writings of the period reveal that women, who were often viewed as physically, intellectually and morally deficient, were considered especially vulnerable to these influences – whether divine or demonic. So a woman claiming to receive special communications from God needed to be especially careful. 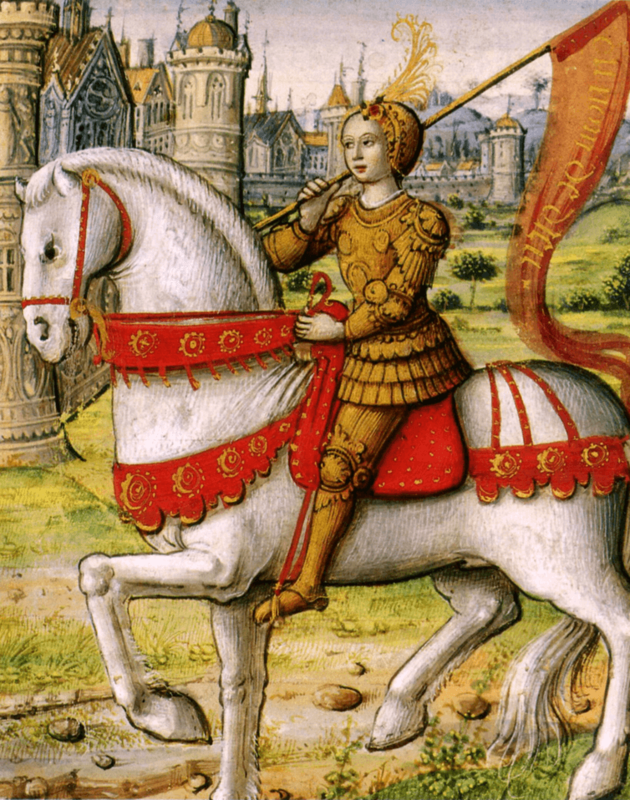 Joan of Arc on horseback, 1505 manuscript. Before sending Joan of Arc to lift the siege at Orleans, Charles VII ordered that she receive a background check and theological examination. The commission assigned to the task endorsed Joan’s piety, but this didn’t protect her from being accused of sorcery and heresy and then burned at the stake once she was captured by her enemies. And English mystic Margery Kempe was also accused of heresy and frequently needed to explain to clerical authorities the nature of her religious experiences in order to receive their approval. Having approval was essential for success: with it, a female visionary could have her experiences recorded for posterity and perhaps even become a saint. Without it the best she could hope for was to die unknown (better, at least, than death or imprisonment for heresy). Melisandre may not need the backing of religious authorities, but she needed Stannis as much as he needed her. Without him to fulfil her prophecies, her faith is shaken. Moreover, even if her message is coming directly from her god, it can be difficult to know how to interpret it. Medieval visionary writings often describe the problems of this next hurdle. The recluse Julian of Norwich contemplated aspects of her visions for 20 years. Even then, she concludes the expanded version of her revelations by stating that, although her work has begun, it has not yet been completed. Completion and full understanding will only be possible in the next life. Only time can tell if Melisandre’s visions are false, or if she has misunderstood the intentions of her god. But, with her most powerful supporter gone, difficult times lie ahead. Whether she will be accused of sorcery and heresy like Joan, rise to prominence like Bridget, or retreat to seclusion like Julian, remains to be seen.